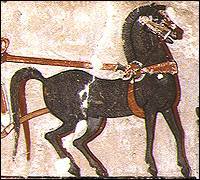 Horses were not common in ancient Egypt. Sometimes they were owned by wealthy people and pulled private chariots. However they were more commonly used to pull war chariots.